Or shall I say, how to love your man and make him ADORE you. I made this for dinner last Sunday and my husband was so so happy, and the Giants won!! So maybe it’s also our good luck burger. Now I don’t usually make things like this – too rich, too fattening, too, too and not special enough for a Sunday dinner, but Steve was so excited about the game last week, we had to rush home from the country and be here in Manhattan to see it. We don’t have TV in the country – just Netflix on the Internet, which by the way, the selection there stinks, and DVD’s on our old Sony. But I saw this Bobby Flay Nacho Burger recipe on the cover of the January issue of Food and Wine and it just seemed so right for the day. It was really good. Really. However in my inimitable way of constantly tinkering with recipes, if I were to make it again, I might do ¼ lb. sharp cheddar and ¼ lb. Monterey Jack cheese in the sauce, instead of all Jack. And I thought the salsa was too sweet. Rather than the pickled jalapeños on top, I think I would put in ½ of a fresh, thinly sliced jalapeño, with the seeds, directly in the salsa and skip the pickled ones all together. I have also switched the order of his process – you need to make the cheese sauce first so it cools and gets thick. MAKE THE CHEESE SAUCE In a small saucepan, melt the butter. Stir in the flour and cook over moderate heat for 30 seconds. Whisk in the milk and cook, whisking, until smooth and thickened, 5 minutes. Stir in the Jack cheese until melted, then stir in the pecorino; season with salt and pepper. Let the sauce cool until it is very thick and spreadable. MAKE THE SALSA In a bowl, combine all of the ingredients and season with salt. MAKE THE BURGERS Light a grill or heat a grill pan on high heat. Form the beef into 4 patties (try to handle the meat as little as possible) and brush with oil; season with salt and pepper. Grill over moderately high heat until browned outside and medium-rare within, about 3 – 4 minutes per side, depending on your heat. Place the burgers on the buns. 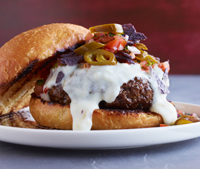 Top with the cheese sauce, salsa, pickled jalapeños and chips. Close the burgers and serve.